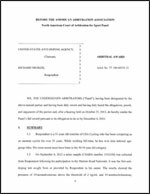 USADA announced today that a three-person, independent panel of arbitrators from the American Arbitration Association (AAA)/North American Court of Arbitration for Sport (CAS) has ruled that Kayle Leogrande of Rancho Cucamunga, CA, an athlete in the sport of cycling, committed an anti-doping rule violation. The AAA/CAS panel found that Leogrande, 31, used the Prohibited Substance, erythropoietin (EPO), when competing in The Point Premium Root Beer International Cycling Classic, on July 26, 2007. Use of a Prohibited Substance is an anti-doping rule violation under the USADA Protocol and the Union Cycliste Internationale Anti-Doping Rules, both of which adopt the World Anti- Doping Code. The AAA/CAS panel sanctioned Leogrande for the maximum period of ineligibility of two years commencing on the date of its decision, December 1, 2008, through November 30, 2010. In addition, all competitive results obtained during The Point Premium Root Beer International Cycling Classic and all subsequent results obtained the through the date of this decision, December 1, 2008, shall be disqualified. “All those who value clean sport should be encouraged by this decision and by those who voluntarily come forward with reliable evidence, placing their trust in USADA, to aggressively pursue those who will cheat their fellow competitors by using prohibited drugs,” said USADA CEO Travis T. Tygart. In an effort to aid athletes, as well as all support team members such as parents and coaches, in understanding the rules applicable to them, USADA provides comprehensive instruction on its website on the testing process and prohibited substances, how to obtain permission to use a necessary medication, and the risks and dangers of taking supplements as well as performance-enhancing and recreational drugs. In addition, the agency manages a drug reference hotline, conducts educational sessions with National Governing Bodies and their athletes, and proactively distributes a multitude of educational materials, such as the Prohibited Substance Guide, easy-reference wallet cards, periodic newsletters, and complete athlete toolkits.